Cryptocurrency markets have been steady for the most part of the last 24 hours, amid a steep decline in prices which took place at around 01:00 GMT today. There are no competitors today for the Binance Coin (BNB), which just made it recently into the top 10 cryptos by market capitalization, leaving behind BSV as it crossed the mark of $1,1 billion. On the same group, ETH, BSV, BCH and LTC are taking the worse part of the losses, with price declines currently exceeding 4% in all cases. 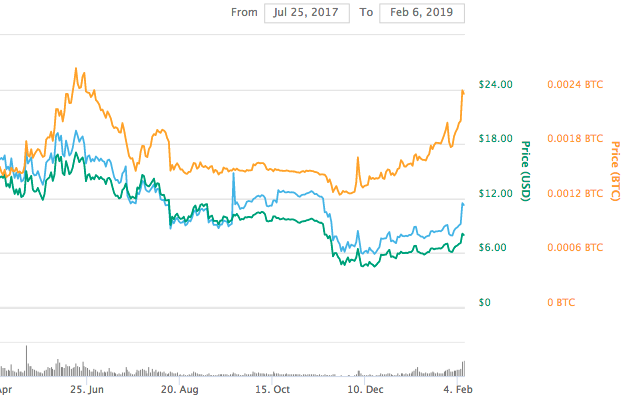 Binance Coin has been showing such impulse among a red market, that it is currently the best performing project of all the first 100 cryptocurrencies by market capitalization, thanks to gains above 12% at writing time. To find a better performing coin, it is necessary to go all the way down to the 142nd token by market cap, Everipedia, a decentralized enciclopedia built on EOS, which is currently gaining 77% compared to 24 hours ago.